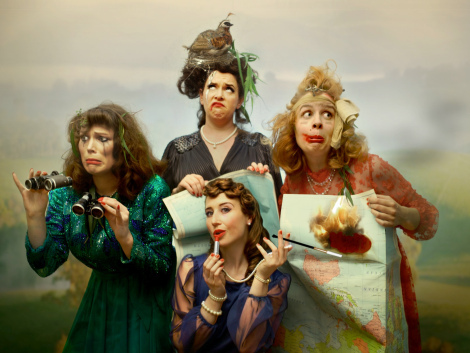 Melbourne;’s female cabaret quartet, Bobby & The Pins, are creatures of comfort who take inspiration from the 1950′s and the era’s stereotypical ‘lady of leisure’. Their forthcoming show Glamping with Bobby & The Pins throws them into the unknown territory of camping. Unperturbed, they decide to transform camping into glamping – glamorous camping – complete with evening wear, hot rollers and crystal champagne glasses. Their triumph is short lived though: the elements always seem to be one step ahead of the Pins and their plans for a relaxing outdoor holiday. Being a glamping novice, I caught up with Bullet Bobby to find out how it’s done. “Generally we only do it when it’s summertime, just because we don’t like the cold. We go anywhere that’s not set up as a normal camping ground because you don’t always want to go where everyone else is. It’s a self-indulgent experience,” she informs me. “One of the things I noticed was really prevalent was the idea of embracing all different body types. I think that’s been re-appropriated in a way,” Bullet Bobby says, referring specifically to the pin-ups of the early twentieth century. Glamping with Bobby & The Pins is showing 3-6 July at Melbourne’s The Butterfly Club. This entry was posted in Arts, Comedy, Theatre and tagged barbershop quartet, Bobby & The Pins, cabaret, glamping, melbourne. Bookmark the permalink.